English: William Hubbs Rehnquist (October 1, 1924 – September 3, 2005) was an American lawyer, jurist, and political figure who served as an Associate Justice on the Supreme Court of the United States and later as the 16th Chief Justice of the United States. 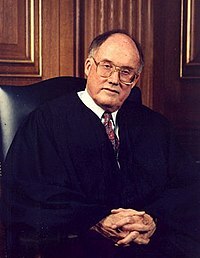 Considered a conservative, Rehnquist favored a conception of federalism that emphasized the Tenth Amendment's reservation of powers to the states. Under this view of federalism, the Supreme Court of the United States, for the first time since the 1930s, struck down an Act of Congress as exceeding federal power under the Commerce Clause. Polski: William Hubbs Rehnquist, 16. prezes Sądu Najwyższego USA. Inauguration of George H. W. Bush, January 20, 1989. Second inauguration of George W. Bush, January 20, 2005. Rehnquist (left) takes the oath as Chief Justice from retiring Chief Justice Warren Burger in 1986. Rehnquist at the rededication of the National Archives Rotunda, September 17, 2003. Rehnquist with Archivist John W. Carlin at the rededication of the National Archives Rotunda, September 17, 2003. This page was last edited on 12 March 2019, at 13:54.